Known for our quality of service, Val d’Isere Location represents a unique collection of luxury homes in the mountains of Val d’Isere, backed by a fun and energetic team who have a passion for sharing the local lifestyle and giving back to the community. We offer rental and non-rental property management. Our properties are picked to ensure they fit in with our portfolio. Whether it’s your home or you would like to rent we know what it takes to deliver outstanding service. Luxury homes in this environment require professional and exceptional attention and care. Our clients expect great properties that are well-maintained, and owners of such high-end properties need to know they are being managed well. With our unique service, your luxury property is in great hands. We proudly maintain a high employee-to-property ratio and provide a hands-on, boutique level of service for every owner, guest and property. We have lived in Val d’Isere for nearly 20 years, so know the resort very well and are on hand if you need anything. We live here all year round to provide a great service to our owners. This speaks for itself as our guests come back year after year and we love having them back. They enjoy the service we offer and the quality of the properties we maintain and provide. Our package is unique for self-catered properties. Exceptional service does not end with our guests. We treat our homeowners like family, and their homes as if they were our own. We strive to profit with our owners, not from them. 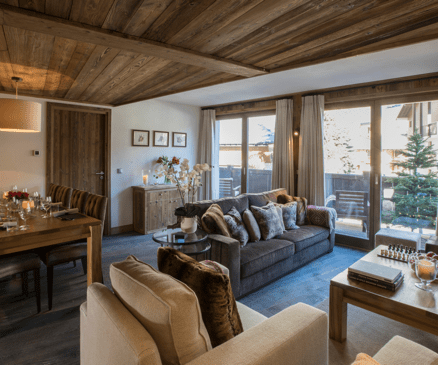 We look for the finest properties to be a part of our Val d’Isere Location property portfolio. If you think your holiday home would be a good fit, please send us details so that we can talk more about your property and requirements.